- Remove the battery from the device with it still on. - Wait for a minute then replace the battery. 2. If you think your device software requires an update, please check for available software updates for your device via Samsung.com and go for an upgrade (optional). 3. Verify if the file you are trying to share is not DRM-protected. HINT: You may be able to view the content on your mobile device but it will not be shared to the TV's screen because it is protected. 1. Get the travel charger and connect it to the power socket on the AllShare Cast Wireless Hub. Wait until the status indicator turns red (usually takes around three or four seconds to appear). 2. 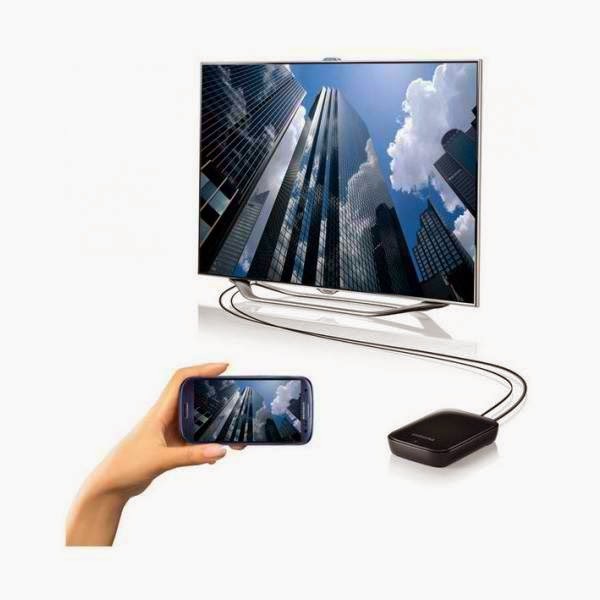 Get an HDMI cable and connect it to the AllShare Cast Wireless Hub and to the HDTV. 3. To match the input port currently used by the HDMI cable, change/alter the source input on your HDTV. 4. Wait until the status indicator starts to blink red and press the RESET button. Doing so will trigger the status indicator to turn blue. 5. On your GS5 device, touch the Menu icon, go to Settings, select Connections and finally, touch Screen Mirroring. 6. Locate and touch the OFF slider to turn the Screen Mirroring ON. 7. When prompted with the list of available devices under Screen Mirroring then locate and select the AllShare Cast Wireless Hub. You should now be seeing the name displayed on your HDTV. 8. Now that your device is already connected, your screen will now be shared automatically. An indication that you've successfully established a connection is a monitor/screen icon that shows up at the top of the mobile device's screen, in the notifications area. B. If problem continues, then try to pair the AllShare Cast Wireless Hub with another device. This will help you determine what, where, or which device is really causing an issue.